One of the discussion threads I follow in the saltosphere is specifically about kids and sailing. This thread has a variety of aspects: Growing the sport of sailing, bringing existing young sailors into sailing for life, developing skills so they can be viable crew on big boats, and looking at ways to diminish the post-college sailor flameout are but a few. Currently the timeline for kids is: Multi colored Opti programs, then 420s/Lasers, into college sailing, then hit rocks – Boom! – stop sailing. Getting a job, the costs of sailing outside school, and what their non-sailing mates are doing are amongst the welcome-to-being-an-adult scenarios that young sailors face. The one constant theme in all youth sailing in the U.S. at the moment is the racing track, more or less literally. This is slowly becoming recognized as self-defeating. Our own son is an example of being pushed out of sailing by this racing meme. Three years of Optis and being yelled at to do this, that or the other, being placed two per boat with someone he did not know, and the special prize, capsize practice in deep water before he was confident enough to take it on. Pushing an 8- or 9-year-old into something things is a great way to have them not like it. Fast-forward about three years or so, when enrolled in a non-racing program. This otherwise typical week of sailing ‘camp’ placed him in a 420 with two other kids, both of whom he knew, in a program of sailing to different parts of lower Narragansett Bay, getting ice cream at the Ben & Jerry’s on Thames Street, pulling up on the beach at Rose Island, and simply hanging out with his mates in a sailing boat, all under the watchful eye of the ‘instructor.’ He came home totally stoked by the first day and, ultimately, the week. When we inquired about the program the next spring we discovered it had been withdrawn; apparently too hard on the boats and gear. We are told today that sailing needs compete with ‘other leisure time activities.’ I am not one hundred percent convinced that sailing is such an activity. While an elite few manage to make a career out of sailing in some form or another, for the rest of us (OK, the rest of you…) sailing is far more than a leisure time activity. It is in large measure a way of life. The kids racing meme, at least up to middle of high school, is as the name implies much more a sailing ‘camp.’ A summer activity more or less the same as all the other ‘camps’ where Junior is delivered early on by one parent and picked up by the other when it’s all over. 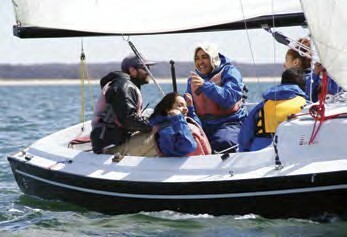 Rarely are kids in sailing camp today from families who sail. It’s just another thing they do. The Storm Trysail Club and its Foundation have, over the past 20 or so years, been at the forefront of what we call the Junior Big Boat Safety at Sea Seminars. These are one-day events for high school sailors with the specific goal of introducing them to the arts and sciences of sailing on something other than a dinghy, but more broadly to show them that there is more to sailing than sailing a shoebox with a rig that many kids never see again after sailing an Opti or two-up in 420s or FJs. The Storm Trysail Foundation is slowly becoming not the only sailing organization trying to expand the horizon of young sailors. This summer, Newport Yacht Club is offering for the second year, a ‘sailing camp’ that is not racing-based but much more focused on the Water Rat’s idea of being around boats. The young sailors use Ensigns and members’ boats over the 2-week programs and the focus is on sailing, not racing. These kids and their mates will have the chance to sail in some of the most spectacular and storied waters in the world.